Moderator Candace Williamson (left) and presidential candidate Britney Deas (right) speaking about campaign objectives at the presidential debate. ORACLE FILE PHOTO/LEDA ALVIM. Though attendance was low, Britney Deas’ passion for her student body presidential campaign remained high in Monday’s unconventional debate. The 700-seat Oval Theater hosted the Student Government (SG) presidential debate before a small audience of about 20 students, mostly wearing purple “Vote Britney and Travis ‘19” shirts. The debate this year was nontraditional because there was only one candidate on stage. Instead of the rebuttals and disputes, Deas was asked 20 questions by the moderator, Candace Williamson, from Housing and Residential Education, relating to her personal life and campaign. 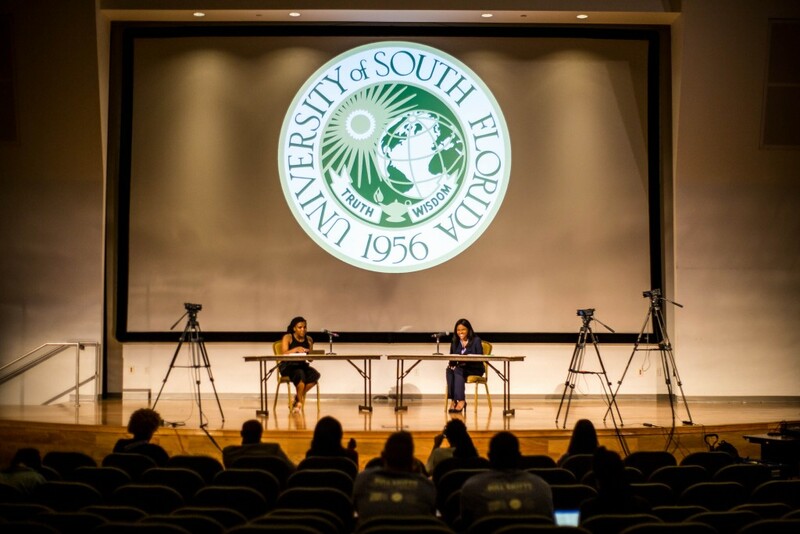 Deas and running mate Travis McCloskey’s campaign is centered on their motto of “creating a BULL S.H.I.F.T.” Throughout the debate, Deas covered her platform’s key elements personified through this acronym, which stands for student success, health, innovation, finance and tradition. Deas addressed her “Bullseye” initiative, which would be an interactive section on the SG website that would keep students updated on SG initiatives, as explained by Deas. Given the diversity on campus, Deas said it is important that the leadership reflects the student body, which was a reason why she decided to run for the position. As a young woman of color, she said she wants to leave a legacy that embodies representation. “I will be the first black female student body president but I don't want to be the last,” Deas said. With President Judy Genshaft’s departure approaching in July 2019, Deas was asked how she would welcome the new university president. Deas said her goal is to foster a relationship with student government and USF faculty. “Having a relationship with administration is very important and sometimes members of SG forget that and lose that respect,” Deas said. “At the end of the day, we’re all here to serve the students. Throughout the question-and-answer period, Deas talked about how she wanted to advocate for students with disabilities, mental health initiatives and commuter students. She also said she wants to create a “roundtable” for topics such as race and sexual orientation. As part of the ticket's “innovation” initiatives, Deas said she plans to advocate at the state level for a sales tax exemption for university textbooks. As a college student balancing an academic and personal life, Deas wanted it to be known that she is just like everyone else when she was asked what the hardest part of this role would be. When asked about what she loved most about USF, ironically, Deas said she was opposed to choosing USF when she was first exploring colleges. But after touring the university, the Miami native fell in love with the palm trees and the aesthetic of the campus. But for Deas, it’s not all about aesthetics. 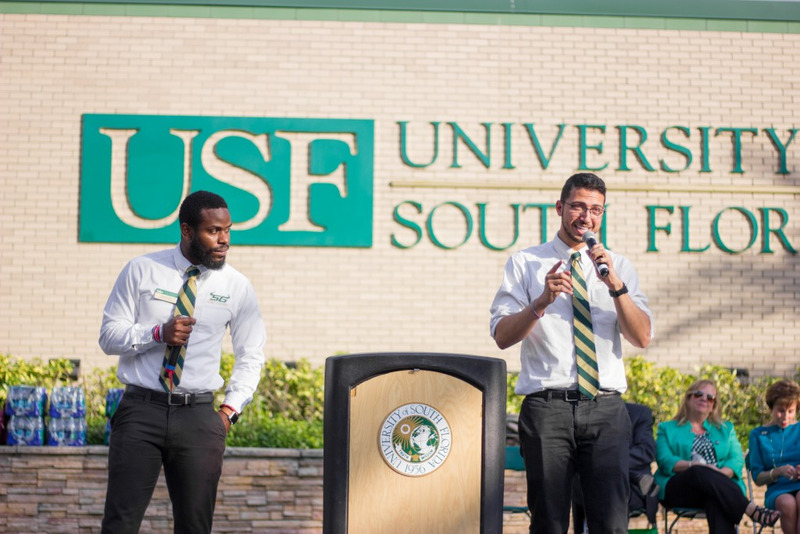 “What brings the way USF looks to the next level is who fills the campus,” she said. After being asked about her self-care routine, Deas said she enjoys eating pasta, watching Netflix and catching up on sleep. She even slipped in a joke about what she likes to do in her free time, which got a laugh from the audience. “Ideally I like to go to the beach, and for those of you that know me, know that I like mermaids and sometimes I think I am one,” Deas said. Students have the opportunity to vote for candidates Feb. 25-28 from 9 a.m. to 5 p.m. outside the Marshall Student Center every day and other polling locations listed on the SG website. “Although we are running uncontested, I invite you to see us at Bull Market, visit our website and come talk to Travis (McCloskey) and me, so we can earn your votes,” Deas said.